King Mohammed VI has gone straight to the point. He brought to light few truths and exposed the dangerous game played by the Algerian regime and other opponents of Morocco’s territorial integrity. In a speech he delivered Wednesday night on the occasion of the 38th anniversary of the Green March, the king said that Morocco does not need to take lessons from those who “violate human rights,” referring to neighboring Algeria. Algeria’s president, Abdelaziz Bouteflika, has criticized the situation of human rights in the Moroccan Sahara, ignoring that these very rights are systematically violated in his own country. In a speech read out on his behalf late October at a meeting on the Sahara held in Abuja, Bouteflika had deemed it timely “more than ever before” to establish an international mechanism to monitor human rights in Western Sahara. His comments triggered the anger of all the Moroccan civil society activists and Moroccan media and critics of many foreign personalities and organizations. 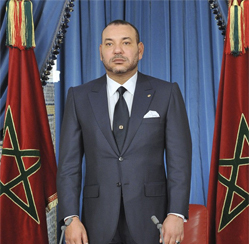 King Mohammed VI has also accused Morocco’s enemies of using money and other advantages in an attempt to “buy votes and get some organizations adopt hostile positions against Morocco” including those which lobby for whatever cause to get easy money. Since the historic Green March, the Algerian leaders who rule the country with an iron hand and who have at their disposal all the oil and gas revenues do not spare any financial, human, political and logistical means to support the Polisario Front’s separatist claims. These leaders think that if they put Morocco in difficulty they can easily impose their leadership throughout the region. “Anyone who wants to outbid Morocco has to go to Tindouf and observe in many surrounding areas the damage caused to the most basic human rights” said the Moroccan sovereign, alluding to the Sahrawi refugee camps and elsewhere in Algeria. Morocco “refuses that some organizations, in reports prepared in advance, take as a pretext some isolated acts to try to undermine its image or minimize its achievements in the field of human rights and development,” he argued. However, the kingdom “accepts, in all responsibility, the constructive criticism” voiced by international organizations “which demonstrate objectivity in dealing with issues of concern to Morocco,” he said.